Welcome to the Bloomington Urban Forestry Research Group! We are a team of faculty, graduate and undergraduate students and partners who conduct research, provide outreach and service, teach classes and make presentations in urban forest management, urban ecology and related subjects. Located at IUB O'Neill and the Ostrom Workshop, and we primarily focus on Bloomington and the state of Indiana, and interact with municipal and non-profit urban forestry programs and partners throughout the Midwestern and Eastern USA and even beyond. On-going Research and Outreach is by major project areas. Publications and Presentations are by calendar year. On-going and past teaching efforts are under Teaching. bufische@indiana.edu, we would love to hear from you. Read about our latest press and activities with our monthly postcards. At the Indiana University Bloomington Urban Forestry Research Group (BUFRG), we study the urban forest as a social-ecological system, a conceptualization that enables researchers and managers to better understand the factors that influence sustainable urban forest outcomes and provision of ecosystem services. 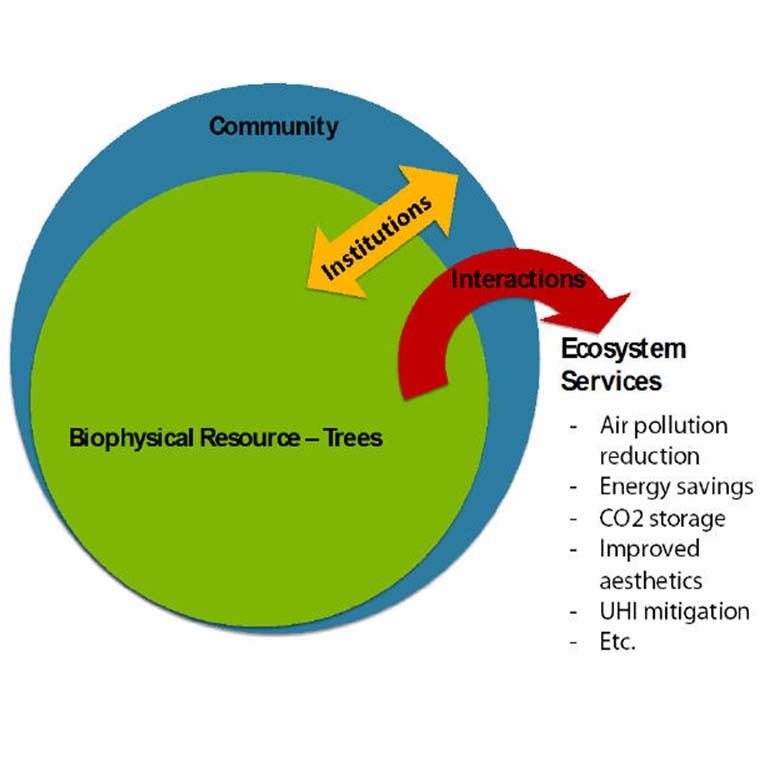 We believe that the urban forest is best understood and studied as a social-ecological system (SES) of linked human and natural components, that emphasizes the importance of the interactions between the biophysical resource, the community and its institutions on the production of observed outcomes such as ecosystem services (see Figure 1). Urban forests can be best understood and studied as a Social-Ecological System (SES) of interlinked human and natural components. The production of ecosystem services in urban forests is affected by the attributes of the “Biophysical Resource” (trees and vegetation structure), the characteristics of the “Community” of resource users and beneficiaries, and the “Institutions” (formal and informal rules, norms and strategies governing how people and groups of people interact with one another and with the physical world) that affect how the community manages trees. The interactions between the community, the biophysical resource and institutions influence the types and magnitude of ecosystem services provided by the urban forest. Our work draws from the Social-Ecological Systems Framework developed by the late Nobel laureate Elinor Ostrom and colleagues (e.g., Ostrom 2009) and the Model of Sustainable Urban Forestry developed by Jim Clark and colleagues (Clark et al. 1997) to generate an integrative framework to inform our study of the factors that influence the structure and function of vegetation in cities (see Table 1). This Urban Forests as Social-Ecological Systems framework informs the research questions, variable selection, and study systems in all BUFRG projects. Clark, J.R., Matheny, N.P., Cross, G., and Wake, V. 1997. “A model of urban forest sustainability.” Journal of Arboriculture 23(1), 17-30. Ostrom, E. 2009. “A general framework for analyzing the sustainability of social-ecological systems.” Science 325: 419-422. Professor Burney Fischer developed the first ever Urban Forest Management course at IUB O'Neill in 2006. The Indiana Urban Forest Council recognized this new college-level teaching initiative in urban forestry because it doubled the number of college course offered from 1 (Purdue University Dept of Forestry and Natural Resources) to 2. The course has continued to be offered each year through spring 2017. 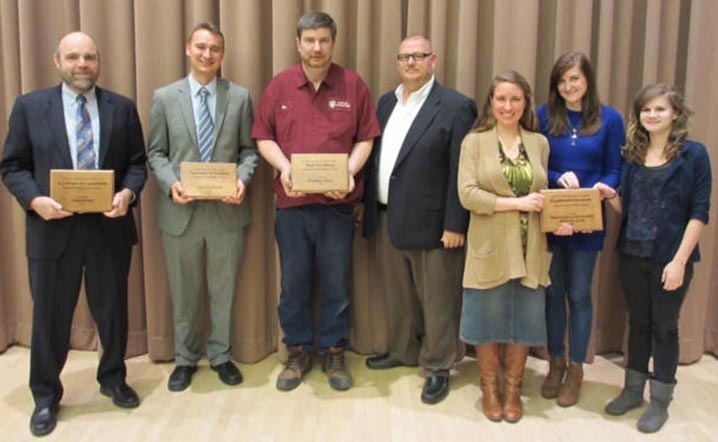 Indiana University, "Excellence in Research" Campus Sustainability Award, 2012.